I've started throwing larger bowls and platters lately, and that's given me an issue with trimming. My foam trimming bat I made a few years ago is only 14" in diameter, and it's pretty easy for me to get a little larger than that. So I need a bigger foam trimming bat, maybe 18". My first thought was to buy one, but as it turns out I can't, and wouldn't want to. First, even Van Gilder's terrific foam bats top out at 15". Second, large bats are inordinately expensive, like $60 or $80 for an 18". Let's look at what we can do more cheaply. 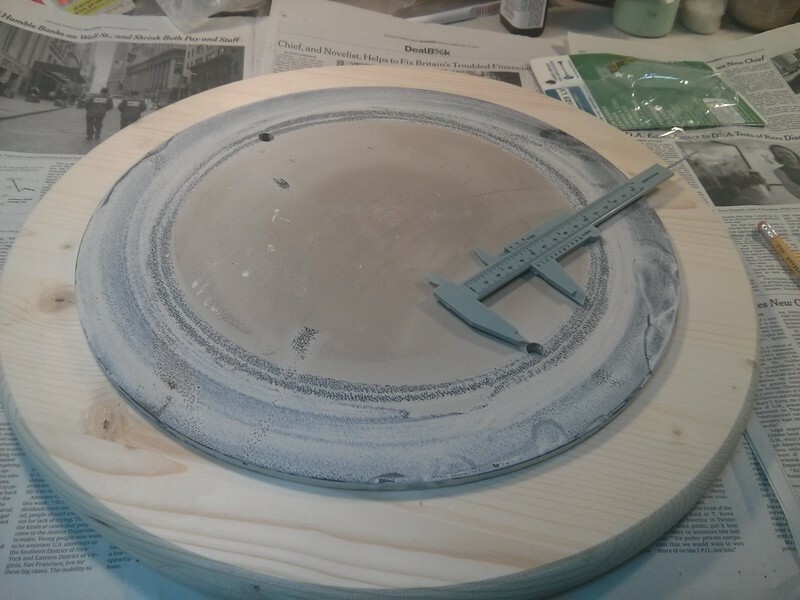 I could have saved a couple more bucks by cutting an 18" circle out of plywood instead, but that would have taken me an hour, so the tabletop. However, I've since discovered that those pine tabletops tend to warp, so if I had to make another one I think I'd use the plywood. 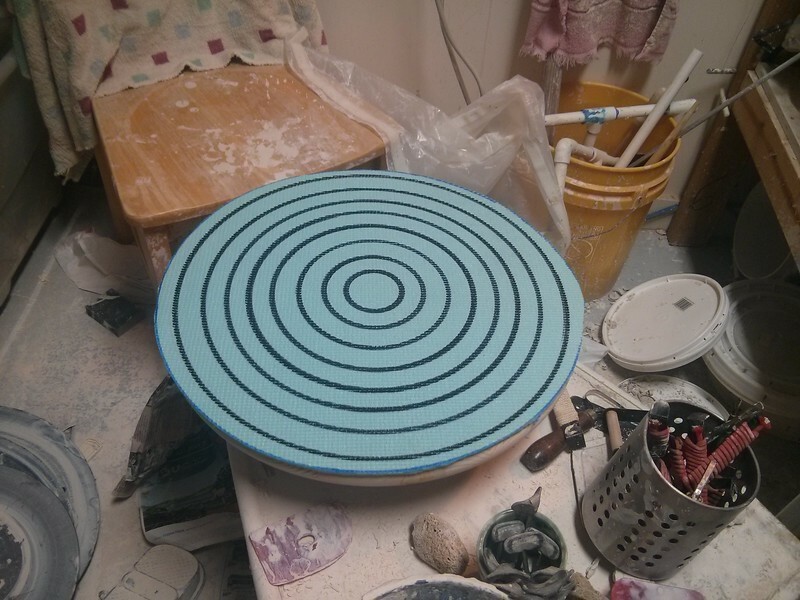 Used yoga matts are a terrific material for cushioning all kinds of ceramic ware, so any time you see one at a garage sale, snap it up. They're grippy, cushy, and cut easily with scissors. 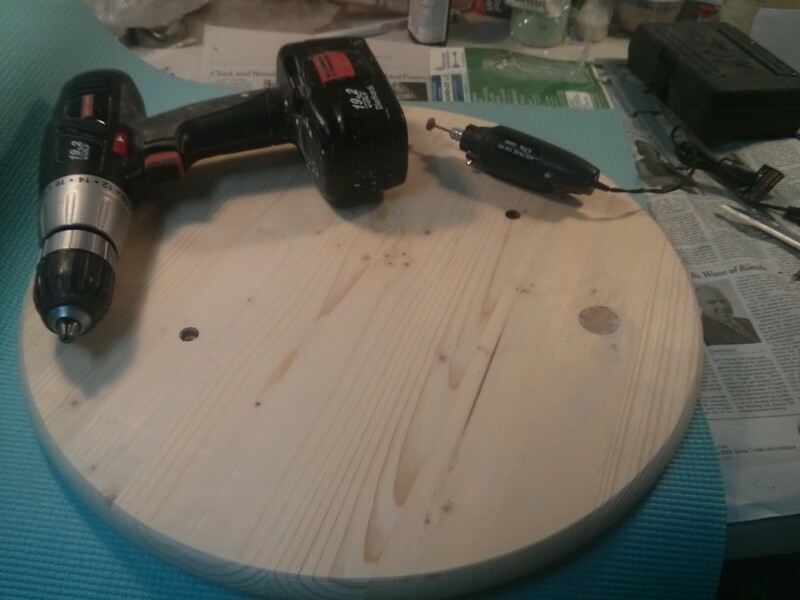 Next: the hard part: you need to drill bat pin holes in the appropriate places. Rather than playing around a lot with measuring, I centered a 14" bat on the wood circle using measuring calipers and marked where its holes were. 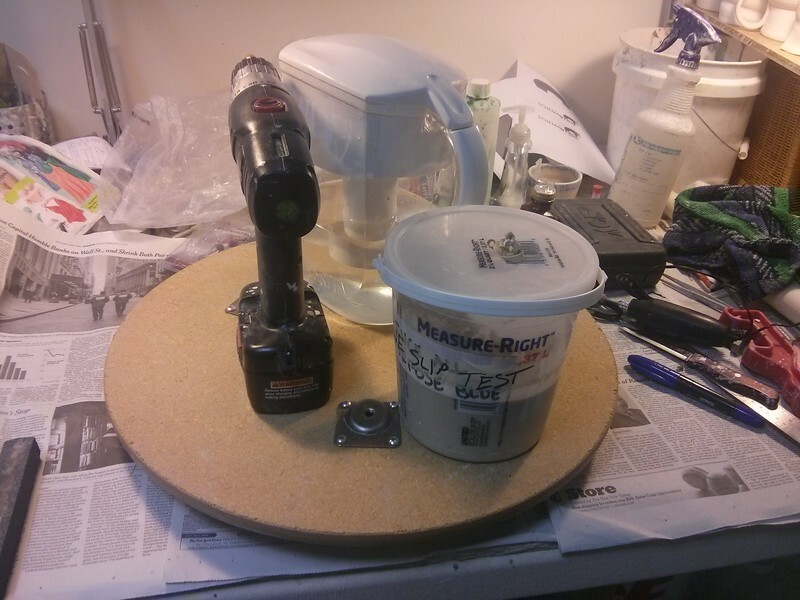 Then I spent a long time with a drill and a Dremel tool carefully making holes the exact depth and size of bat pins. Periodically, I put the bat on the wheel to check fit. Cutting out the yoga matt was easy. I just traced the wood and then cut. 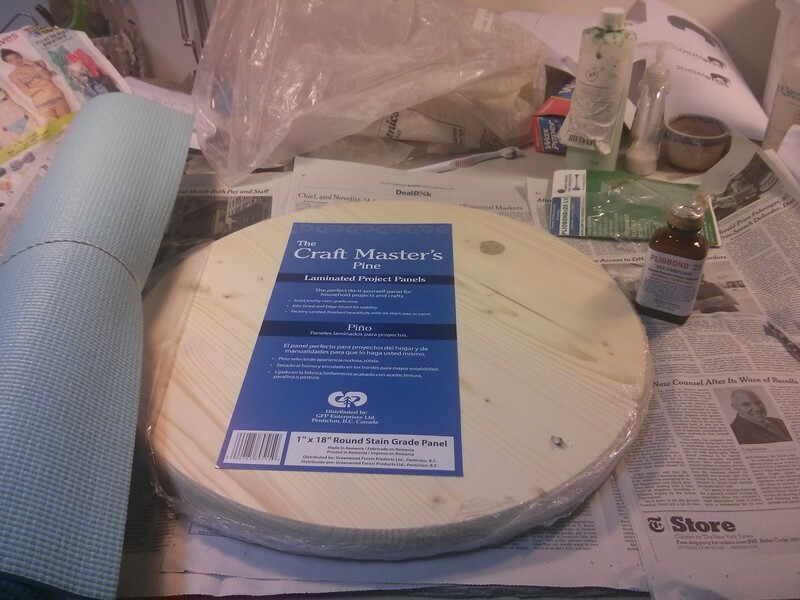 For gluing the matt to the board, I used contact cement. This seemed the best choice, because I wanted a lasting bond, and it needed to be something which would stick to the flexible, spongey yoga matt material. However, this meant I went through 2/3 of a bottle of contact cement. 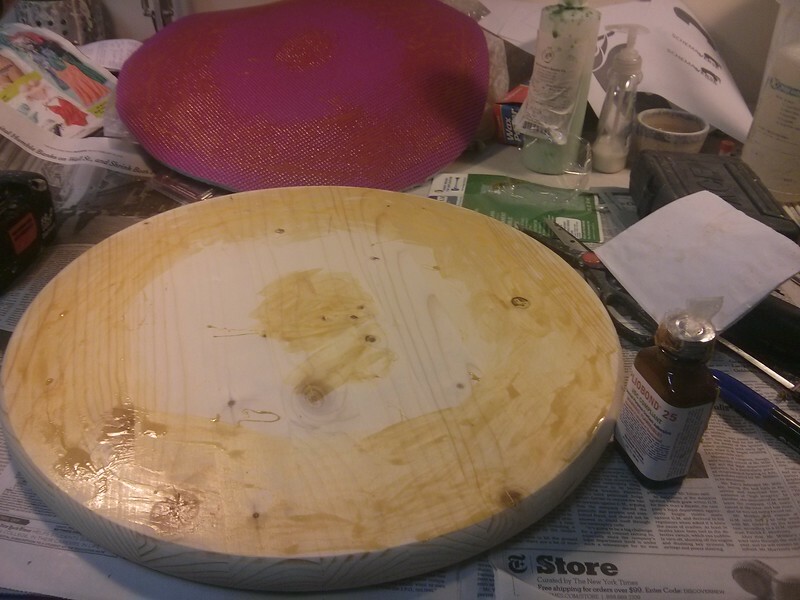 Then I put a larger tabletop on the stack and pressed for an hour to set the glue. After I took this picture, it occured to me that a 25lbs bag of clay made a better weight, and swapped them. Once the glue was set, I put the bat on the wheel and drew centering circles, about 1" apart, on it with a jumbo Sharpie. Foam bat done! Anyone wanna buy a 15" serving platter?